Zoolander 2 might not be much of a movie—the upcoming Ben Stiller comedy has been "critically savaged"—but the movie's marketing campaign has been epic. In its latest masterstroke, Paramount Pictures has teamed up with NBCUniversal for a multiplatform, cross-portfolio series of PSAs parodying NBC's "The More You Know" campaign. 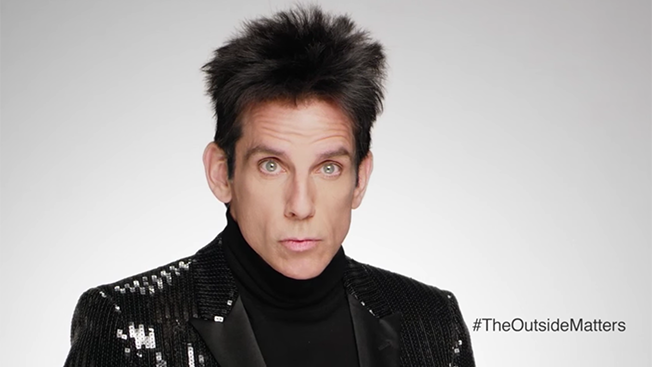 In the series of spots, called "The Outside Matters," Stiller's male model character Derek Zoolander will tackle society's most serious issues, like the importance of outer beauty. Stiller stars as Zoolander in all of the spots, which will air on NBC, Bravo, E!, USA and Telemundo, as well as the networks' digital and social platforms. The videos, which were created by Paramount and NBCU's in-house Content Innovation Agency (CIA), will be tailored for each network's audience. Fandango will release all the videos on its Fandango site (where bonus content will be available), as well as its Facebook, Twitter and Instagram feeds. "I can't underscore enough the power of contextually relevant content that engages fans of the franchise and attracts new audiences," said John Harrobin, NBCUniversal's CMO for advertising sales, in a statement. "That's exactly what this humorous campaign does, while staying true to the film's spirit. There is no one better to raise awareness about this movie than Derek Zoolander himself, through parody PSAs tailored to each of our diverse audiences at scale." Stiller and Paramount have gone all out to promote Zoolander 2, with marketing stunts that have included everything from a Fiat appearance to a bespoke perfume ad campaign. Last week, Derek Zoolander crashed Barbie's Instagram, while on Tuesday, Kiehl's opened The Derek Zoolander Center for People Who Don't Age Good in New York's West Village. Stiller got an early jump on his NBCU appearances last weekend, when he popped up on Saturday Night Live as Zoolander, alongside Owen Wilson's Hansel, to discuss politics. Yes, politics.